testo Emissions: Testo and Veto are a winning team! Testo and Veto are a winning team! Testo and Veto Pro Pac have teamed up to offer technicians a premium offer at a great value. When a technician purchases any Testo combustion or emission analyzer kit, they will receive a Veto tool bag free! 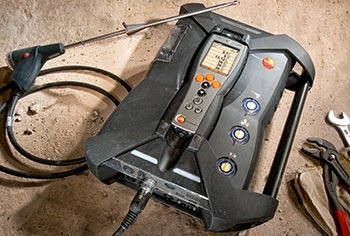 The testo 350 portable emission analyzer raises the bar in testing serviceability. Its design allows for routine service and "plug and play" convenience – no tools needed. Simply click out the sensor, or chiller filter, or pump – it's that simple. Optimizing combustion, increasing efficiency and minimizing fuel use are necessary to compete in today's market. The testo 340 four gas combustion analyzer provides the information to understand your process, enabling you to make informed combustion decisions. With field-replaceable pre-calibrated sensors, you have zero down-time and keep testing. It is the ideal tool to confirm proper set-up or identify emission problems. Buy a testo 340 or a testo 350 emission analyzer kit and get a Veto Pro Pac TECH-LC bag free! 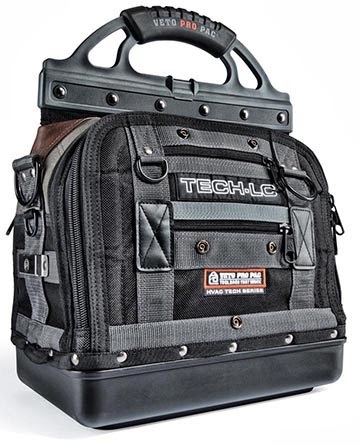 The TECH-LC bag has been made to accommodate a technician's tools and work routines. 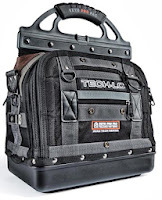 It sports 53 pockets and eight small neoprene pockets, providing ample room for everything a technician needs at the job site. To learn more about this great offer check out the fall promotion page or call toll-free 800-227-0729.